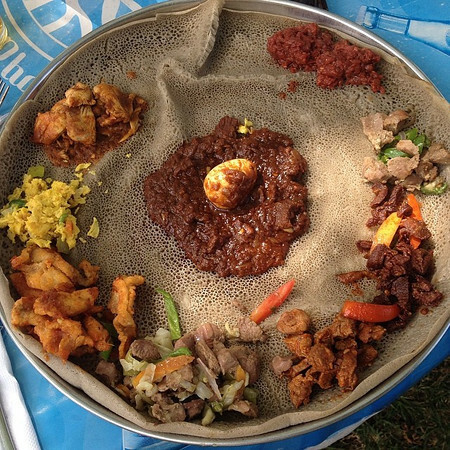 An overview of Ethiopian food, from injera to mixed plates to stews (wats), kitfo, and coffee. 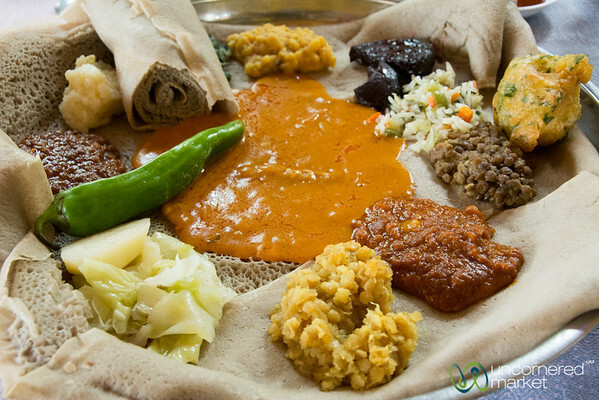 Includes Ethiopian vegetarian and meat dishes. 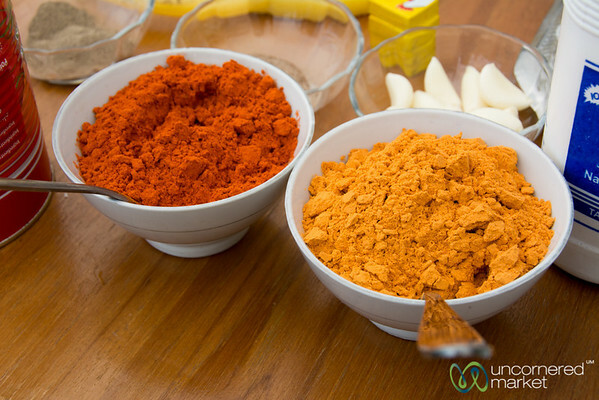 Essentials to an Ethiopian kitch - berbere (chili peppers mixed with spices) on the left and shiro powder (chickpea powder) on the right. Taken in Lalibela, Ethiopia. 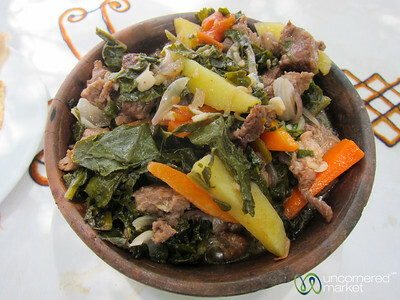 Ethiopian dish of gomen besega (kale, potatoes, carrots and onions with beef) at 7 Olives restaurant in Lalibela, Ethiopia. 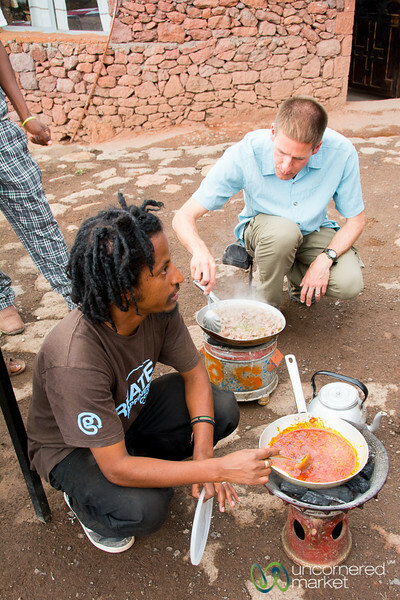 Learning to cook Ethiopian food -- mesir wat, a spicy lentil stew -- at Lalibela Lodge in Lalibela, Ethiopia. 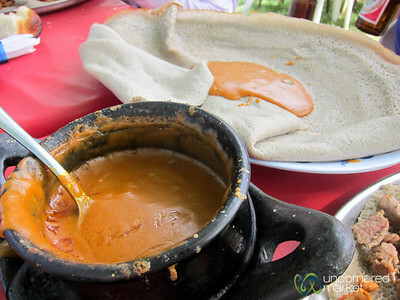 A bowl of tasty shiro (chickpea flour stew) at Lake Shore Restaurant in Bahir Dar, Ethiopia. 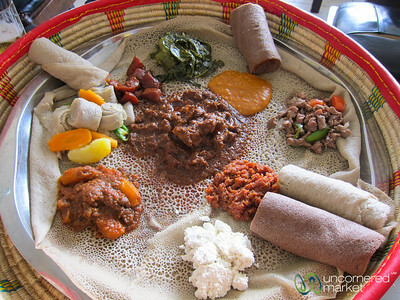 A delicious Yetsom Beyaynetu (vegetarian fasting platter) at Four Sisters Restaurant in Gondar, Ethiopia. 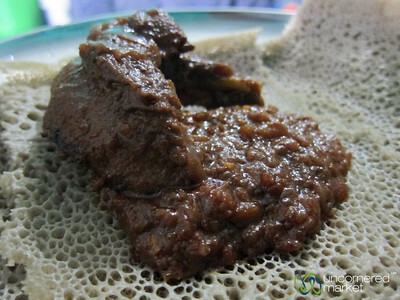 Ethiopian food at its best. 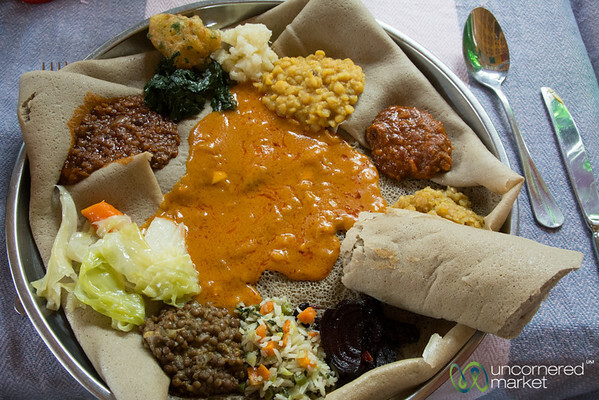 A delicious last meal in Ethiopia at Kategna Restaurant in Addis Ababa, Ethiopia. 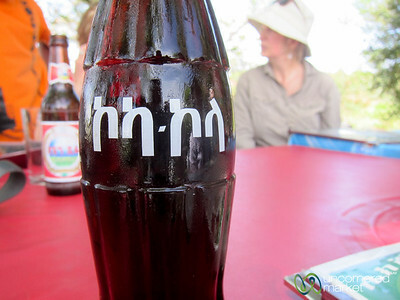 Coca Cola in Amharic, an Ethiopian language. 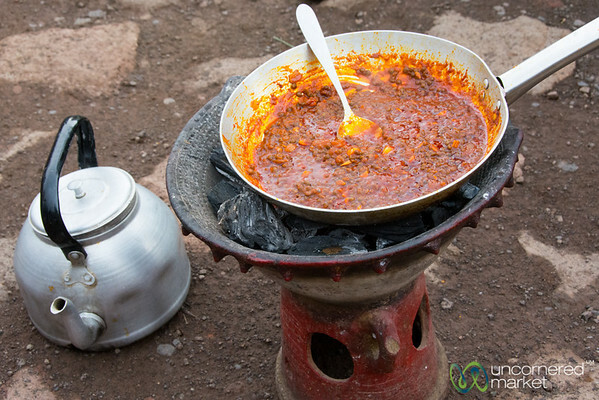 A serving of doro wat (Ethiopian chicken stew) on a piece of injera (spongy flatbread) in a family home in Gondar, Ethiopia. 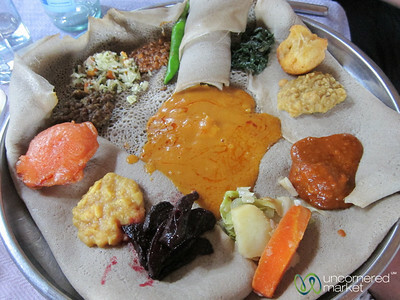 A delicious vegetarian platter (yetsom beyaynetu) at Four Sisters Restaurant in Gondar, Ethiopia. 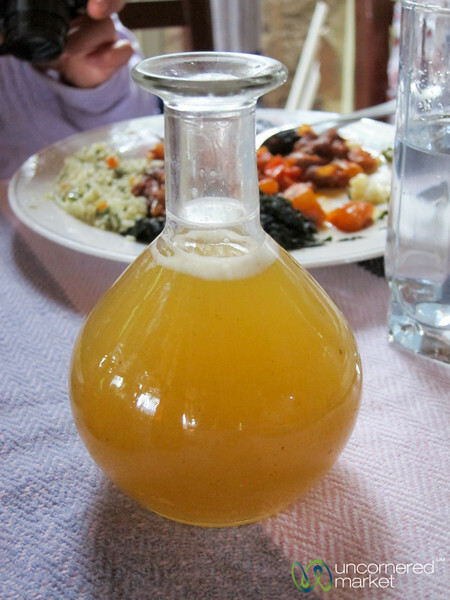 A little Ethiopian honey wine to finish off a meal at Four Sisters Restaurant in Gondar, Ethiopia. 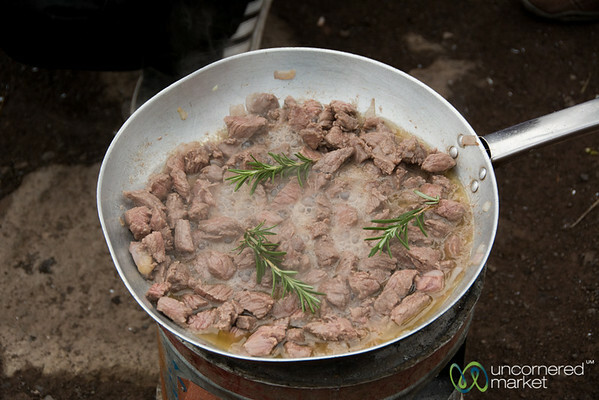 Learning to cook Ethiopian food -- tibs, beef with clarified butter, onion and rosemary -- at Lalibela Lodge in Lalibela, Ethiopia. 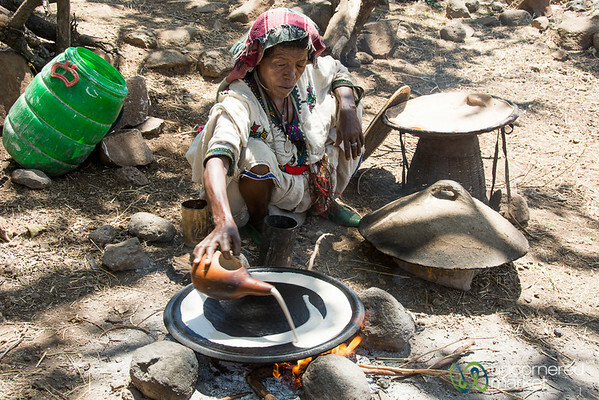 Impromptu Ethiopian cooking class at Lalibela Lodge in Lalibela, Ethiopia. 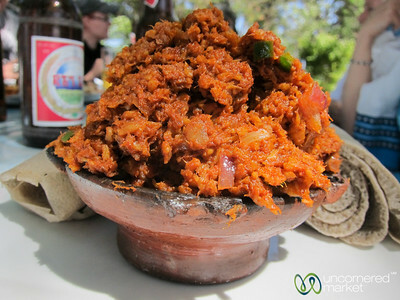 Big bowl of fish kitfo at Lake Shore Restaurant in Bahir Dar, Ethiopia. Spicy & tasty. 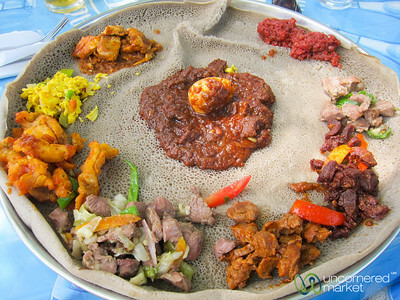 An incredible Ethiopian meat mixed plate (Maheberawi) at Lake Shore Restaurant in Bahir Dar, Ethiopia.